As golfers know, there are two kinds of us: The first keeps bag tags and logo balls neatly arranged, is likely to remember most, if not all, holes he or she has played, and can give you the running total of courses tallied to date. The second recalls that he’s played a whole lot of layouts, scorecards from which can be found in a cardboard box in the corner of the office. 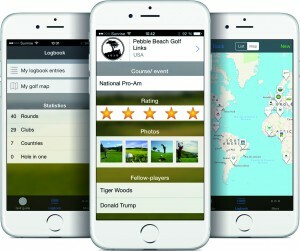 Expert Golf “Golf Guide & Logbook” seems designed with the first type of player in mind. It’s a free app — https://itunes.apple.com/us/app/expert-golf-golfguide-logbuch/id972113748?mt=8 — by Yves Ton-That, author of Golf Rules Made Easy Golf Etiquette Guide. And while yours truly is resolutely in the latter category of golf personalities, I acknowledge some regret at not having been more diligent in documenting my golf experiences. If only the “Logbook” feature had been at my disposal. It allows you to record all the salient data of a round just played, including score, playing partners, and a rating that will be pooled for inclusion in the Golf Guide section. The guide’s claim that it lists every course in the world has thus far not undergone a comprehensive trial – it’s “maintained and extended on a daily basis” – but the sample listings checked seemed to have the relevant contact information and other essentials. Available in multiple translations. At the very least, it ought to be useful for golf trivia contests. Whether you’ll want to include every last detail of the round you just hacked your way through is a personal choice.